MV Sycamore docking in Osborne South. 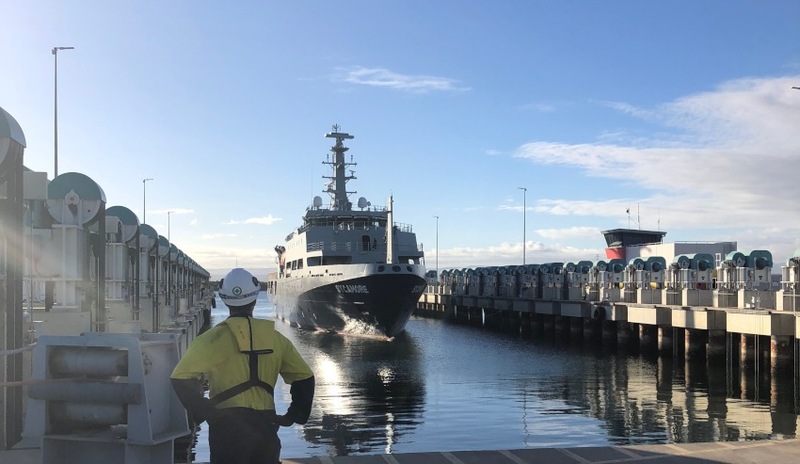 The first ship outside of the Air Warfare Destroyer program has docked at the Osborne South shipyard since it was acquired by Australian Naval Infrastructure, with ASC Shipbuilding workers set to commence work in assisting in the maintenance of the advanced multi-role aviation training vessel, MV Sycamore. ASC Shipbuilding has been contracted by the vessel’s operator, Teekay Shipping (Australia), for this project to provide specialist support to complete the work on MV Sycamore within a tight deadline at the Osborne South shipyard, owned by Australian Naval Infrastructure. ANI is the government business enterprise launched by the federal government last year and owns the shipyards and shipbuilding infrastructure previously owned by ASC, ASC Shipbuilding and Techport Australia (acquired from the South Australian government). "This engagement shows how ASC’s shipbuilders can provide high-level services in support of the local industry, leveraging the capability we have developed in the Air Warfare Destroyer program," said Jim Cuthill, ASC Shipbuilding acting CEO. “Our work on the MV Sycamore sets a precedent in working co-operatively with the newly established Australian Naval Infrastructure as it attracts more work to the Commonwealth-owned shipyard in Osborne, South Australia, in coming years." MV Sycamore's primary mission is training of helicopter/UAV pilots and flight deck crew, including simulated HIFR (helicopter in-flight refuelling) operations. ASC Shipbuilding will complete the MV Sycamore work shortly, a job expected to create work for up to 30 employees and contractors during the docking. Australia's sovereign shipbuilder is gearing up for future projects, including two of the government's coveted naval shipbuilding projects. "ASC Shipbuilding is preparing to move on to future programs, starting with construction of the lead OPVs later this year with prime contractor Lürssen, and is strongly placed to become the Australian shipbuilder of the Future Frigates, starting in 2020, subcontracting to a prime contractor-designer of the government’s choice," Cuthill said. ASC's inclusion in the Future Frigates project was far from assured, with various politicians lobbying the federal government to change the SEA 5000 tender conditions and mandate the use of ASC. Inclusion of the sovereign shipbuilder in the $35 billion Future Frigates project came back on the table after the government's controversial decision to bring in Austal to the SEA 1180 project. Former ASC Shipbuilding CEO Mark Lamarre spoke with Defence Connect last year about the SEA 5000 project and said the organisation’s initial fears of missing out on a role in the project dissipated after the OPV decision brought a change of dialogue with all three SEA 5000 bidders – BAE Systems, Fincantieri and Navantia. “We were concerned when the [SEA 5000] request for tender became public, with some of what we read there and since that time there's been a bit of change with the dialogue that we've had with the Future Frigate designers,” explained Lamarre. ASC chair Bruce Carter has also said publicly this year that he was confident the locally-owned shipbuilder would be awarded a significant role in the program. A decision on the $35 billion project is expected as early as the end of April.